Handheld computing veteran Palm has unveiled its Pre smartphone at CES. The touchscreen handset runs a web-centric operating system that aims to help people organise and manage their many online contacts and identities. The device is widely seen as a competitor to rival smartphones such as the iPhone, BlackBerry, N97 and G1. The gadget will be available on the Sprint network in the US before June 2009. Palm has not said when it will debut in other nations. Palm showed off the Pre at a lavish news conference at the Venetian hotel and casino in Las Vegas. Introducing the Pre, Jon Rubinstein, executive chairman of Palm, said the rise of the smartphone signalled a significant "transition" in what people expected from their handset. Rather than just take and make calls, he said, people wanted their phones to act as a co-ordinating centre for their online lives. "The opportunity is to take all of that information wherever it is and put it all in one place - in your hands," he said. Palm's history meant it was well placed to create a gadget to fulfil this need, said Mr Rubinstein. In the late 1990s Palm was synonymous with handheld gadgets thanks to the success of its iconic Palm Pilot line and follow-on products such as the Treo. "The next wave is likely mobile devices and Palm's DNA is mobile and always has been," said Mr Rubinstein, who joined Palm from Apple where he was influential in creating the hugely popular iPod portable music player. As well as a touchscreen that lets owners scroll through lists, zoom in on pictures or control media with a finger touch, the Pre also has a "gesture area" below the screen on the lower part of the phone. Performing gestures, such as a thumb swipe, on this area owners perform other tasks, such as bringing up a main menu, without having to obscure what is on screen. The device also has a slide out Qwerty keyboard, removable battery, three megapixel camera and 8GB of memory on board. The Pre also comes with a "touchstone" so it can be recharged wirelessly. This allows applications on the phone to run concurrently and also organises all the information accessed via the handset. For instance, when users visit sites such as GMail, Facebook and others the phone grabs copies of contacts then compiles a master address book of all the people someone knows and the ways to contact them. 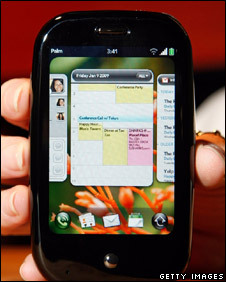 But, said Palm boss Ed Colligan, the software does not force owners to mash all their contacts together. "Our lives live in different places on the net," said Mr Colligan, "a lot of people do want to simplify their lives but they want to keep the info in those silos." He said the device was not intended to be connected and updated via a PC. Instead, he said, it assumes that it will connect to the net. It can be linked to a PC to allow owners to transfer data or load content from partners. Also due is an applications store that will be populated with software from third-party developers. Despite the positive reception the Pre won, Mr Colligan acknowledged that there was much more to making it a success than just making gadgets. "This is a point in time," said Mr Colligan, "we can celebrate for a day but the reality is that we have to ship the product and build our distribution network." Already, he said, Palm had drawn up plans for a whole product line that would be rolled out over the coming months. All the devices would bear Palm's name and be wholly Palm products, he said. "If you do not make the hardware those kind of fundamental design things like the gesture area do not get incorporated into it," he said.